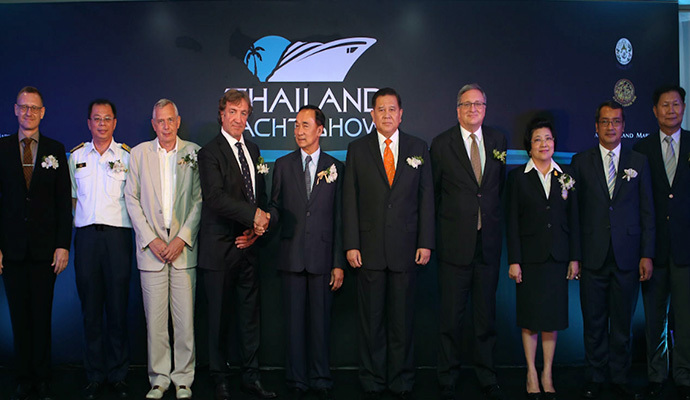 Andy Treadwell and the official Thailand Yacht Show launch party delegation. Scheduled for 8 to 14 February, the Thailand Yacht Show aims to position Phuket as a major global yachting hub. The Thailand Yacht Show was officially launched at an international press conference and private launch party in Bangkok, hosted by Deputy Prime Minister, General Thanasak Patimaprakorn. It was the PM’s initiative to create an international Yacht Show for Thailand, and make Phuket the principal hub for superyachts in Asia. Also in attendance was the Deputy Minister of Transport, Mr Omsin Chivapruek, also involved in and highly supportive of the Yacht Show, together with around 150 specially-invited VIP guests. Andy Treadwell, founder and owner of SYE opened proceedings and commented: “I am absolutely delighted that, thanks to the initiative of the Prime Minister himself, and the tremendous proactivity of the Minister of Transport and the Director General of the Marine Department in particular, we have recently been able to announce the new charter license for foreign-flagged superyachts. The proceedings took place at the Port Authority of Bangkok’s VIP Reception Rooms, before guests were invited onboard the sensational 41-metre, Norman Foster-designed motor yacht Ocean Emerald – the first yacht to have been presented with the new Superyacht Charter Licence by Minister of Transport. More than just a four-day yacht show for local and international charter yachts, the marine festivities will extend for seven days from the 8 to 14 February in and around Ao Po Grand Marina. Activities will range from recreational sailing, paddle boarding, watersports right through to in-depth industry conferences. Tours of significant marine and tourism infrastructure will also be conducted to familiarise international brokers on the possibilities in Phuket and broader Thailand. There will be something for everyone looking for a Thai boating and yachting adventure.